Certainly one of the jewels in North Devon’s crown is The Tea on the Green, Westward Ho! – click the link for its website The Tea on the Green – and it is a must for all visitors. Locals queue outside waiting for them to open the doors in the morning. We’re real coffee snobs and one thing we like about Tea on the Green (apart from the cake!) is that the coffee is very good – strong but smooth. The service is excellent too. 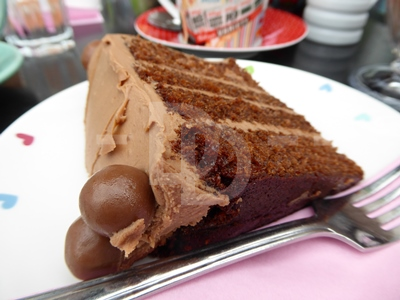 Chocolate malteser cake for morning coffee at Tea on the Green, Westward Ho! As a ‘well done’ to our daughter who had spent the previous three evenings (and a matinee) performing at The Queen’s Theatre, we took the famalam to Westward Ho! for morning coffee and treats. The kids love it there as it’s pure child indulgence – both had milkshakes with ice cream, squirty cream and sprinkles – if you can’t do it as a child when can you! Our daughter tried the waffles – pictured above – covered in chocolate sauce and ice-cream. It looked (and apparently tasted – we couldn’t have got a look in even if we tried!) amazing and she loved it! 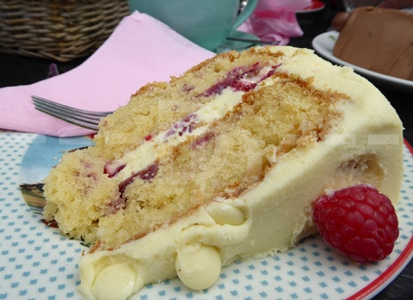 Raspberry and white chocolate cake for afternoon tea at Tea on the Green, Westward Ho! Our son had the chocolate malteser cake with chocolate milkshake (there is a theme here!) which he said was just yum! What’s amazing about Tea on the Green is that the majority of the cakes are gluten free – they subtly advertise this by changing the colour of the writing on the glass cabinet. The cakes are on different shelves and safely served with separate utensils. Tea on the Green state that this cake can also be gluten free if you remove the maltesers. I would never take the risk personally. 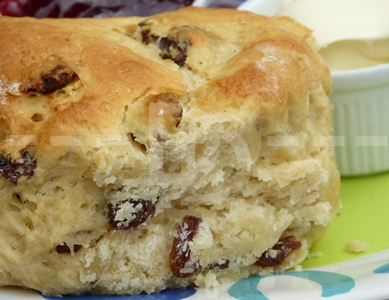 A gluten free scone for afternoon tea at Tea on the Green, Westward Ho! My mum had a fruit scone and hubby and I shared a warm, freshly baked gluten free fruit scone and a raspberry and white chocolate cake with copious amounts of strong coffee to give us that Sunday morning kick start! Opening hours: 11:00am – 5:00pm Wednesday to Sunday (closed Monday and Tuesday). Gluten free friendly: Very! Extensive cakes. Child friendly: They have child friendly treats and high chairs. Space inside is limited, so buggies need to be left outside. Disabled access: Very limited space means wheelchair access inside could be difficult. Dog friendly: Dogs are allowed on leads outside.